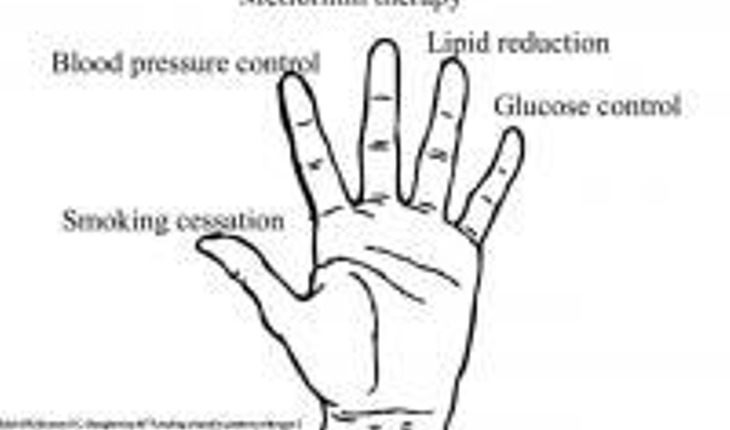 The “lend a hand ” illustration that accompanies this article shows an open palm with the five major forms of diabetes interventions are arranged in descending order of importance from thumb to little finger as follows: smoking cessation, blood pressure control, metformin therapy, lipid reduction, and glucose control. An editorial in a February 2014 issue of the journal American Family Physician notes that researcher at Tufts University in Boston propose this simple way for physicians to communicate with patients about the best treatments for diabetes. The “lending a hand” illustration reprioritizes treatment goals, based on research on mortality reduction, to convey that glycemic control is no longer the primary intervention. Shaughnessy and colleagues wrote the editorial on their “lending a hand” illustration to demonstrate the paradigm shift in treatment priorities. “Lending a hand” emphasizes interventions that improve length and quality of life for those living with type 2 diabetes, in line with new guidelines from the American Diabetes Association and the European Association for the Study of Diabetes. According to the National Diabetes Information Clearinghouse, approximately 25.8 million Americans have diabetes, and seven million of those may not be diagnosed. The NDIC further estimates that type 2 diabetes accounts for 90 to 95 percent of all cases of diabetes. Diabetes is a major cause of heart disease and stroke and the leading cause of new cases of blindness among adults. “Our aim in proposing ‘lending a hand’ is to communicate the most beneficial interventions patients can make to reduce their symptoms and risk of death from diabetes complications. But this model requires a shift in thinking away from the outdated idea that glucose reduction is most important, which may be a challenge,” said first author Deborah Erlich, M.D., M.Med.Ed., assistant professor at TUSM, assistant family medicine clerkship director, and program director of the new Carney Family Medicine Residency, a TUSM affiliate. “Working to control blood glucose while not addressing the other risk factors first is like rearranging deck chairs on the Titanic. The ship’s going down,” said author David Slawson, M.D., professor and vice chair of the department of family medicine, director of the Center for Information Mastery, and director of the family medicine fellowship at University of Virginia School of Medicine.